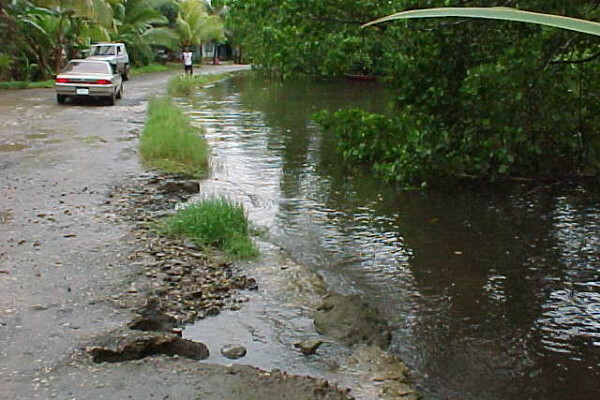 High tide flooding at Tafuyat (22 December 1999). 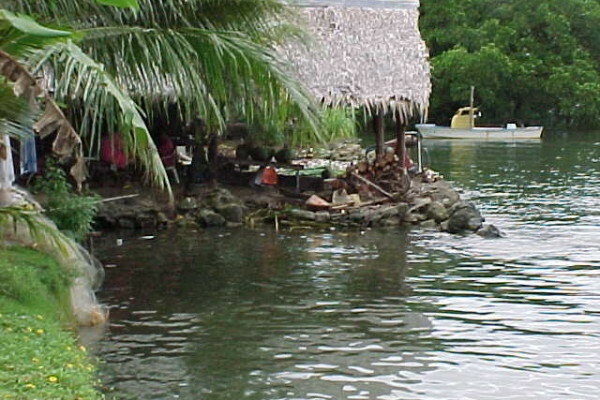 High tide flooding at Skilling's Store, Lelu Island (22 December 1999). 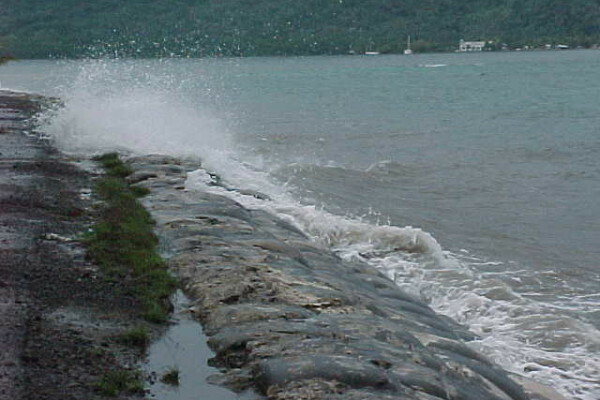 Wave overtopping of the seawall at Leyot (22 December 1999). 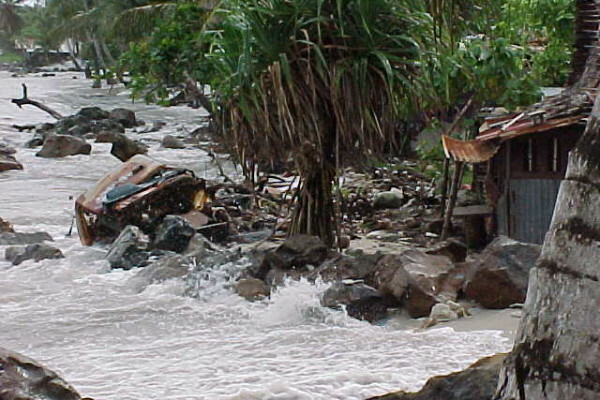 High tide flooding and wave overwash at Malem (22 December 1999). 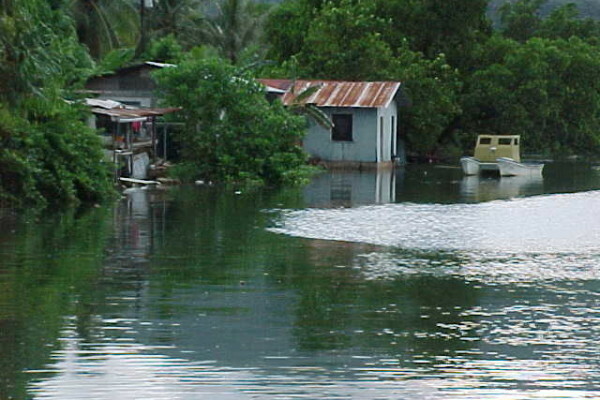 High tide flooding at Finpukal (22 December 1999). 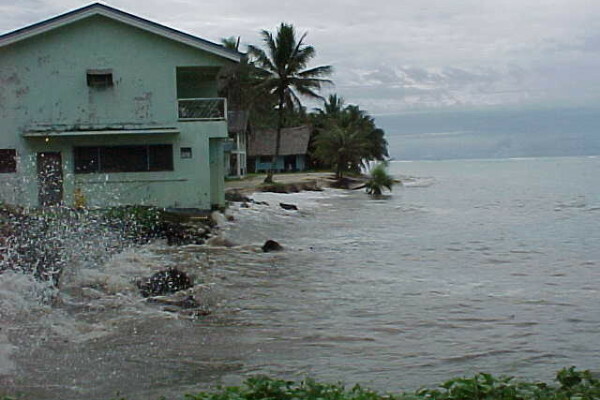 High tide flooding and wave damage at Sandy Beach Hotel (22 December 1999). 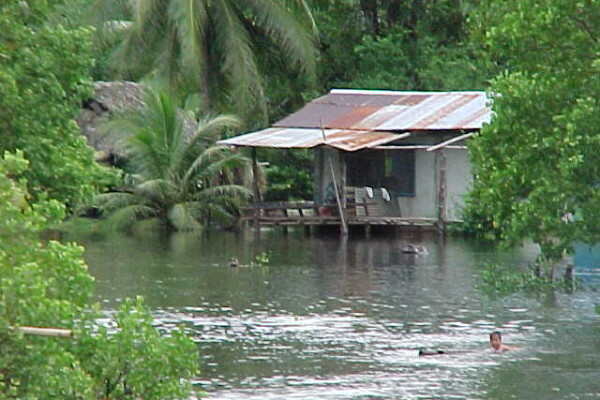 High tide flooding on Lelu Island (22 December 1999). 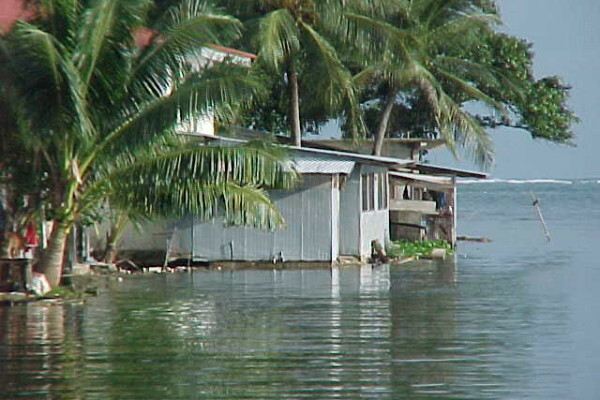 High tide flooding at Lelu Island (22 December 1999). 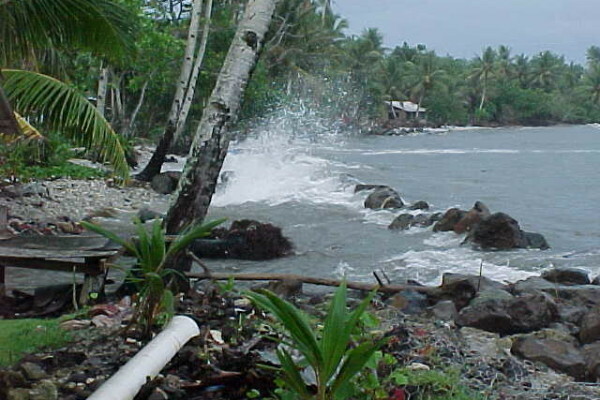 Wave overwashing at Malem (22 December 1999). 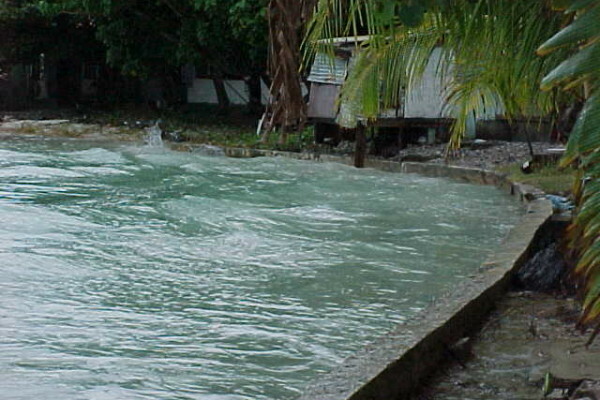 Wave overwashing at Tafunsak (22 December 1999). 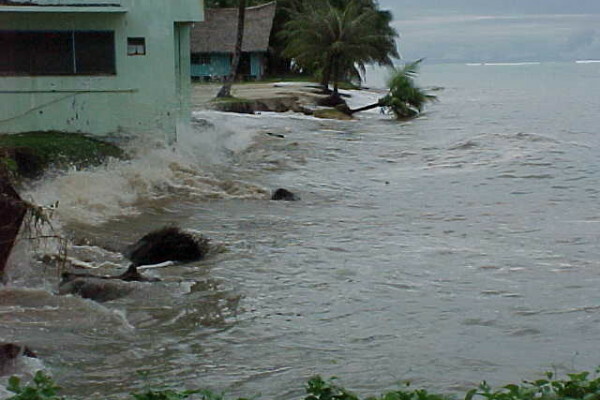 Wave overtopping at Tafunsak (22 December 1999). 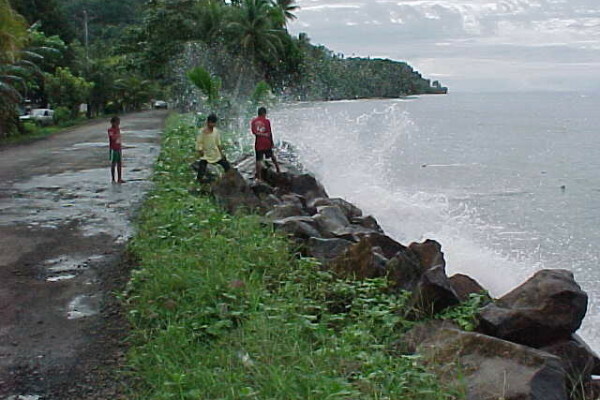 Wave overtopping at Finpukal (22 December 1999). 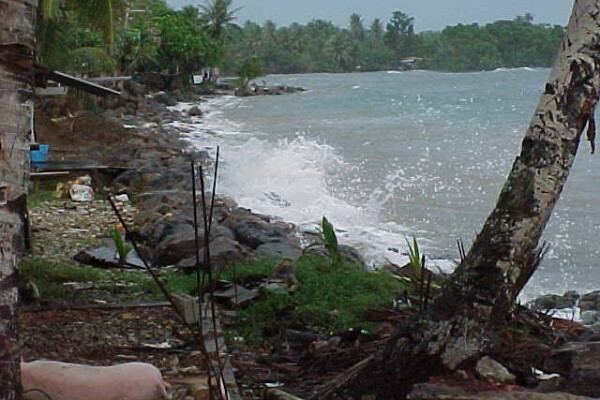 Wave damage at Sandy Beach Hotel (22 December 1999). 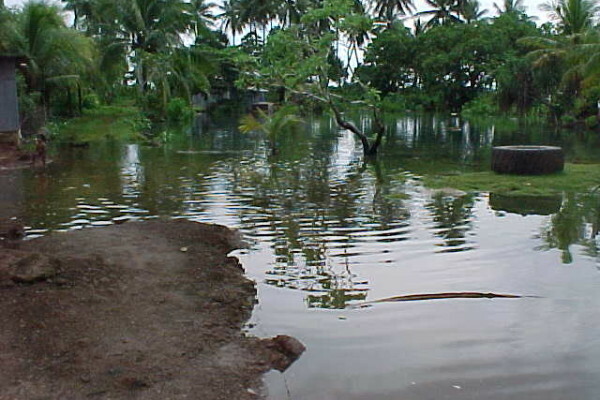 High tide flooding at Taf Te, Utwe (22 December 1999). 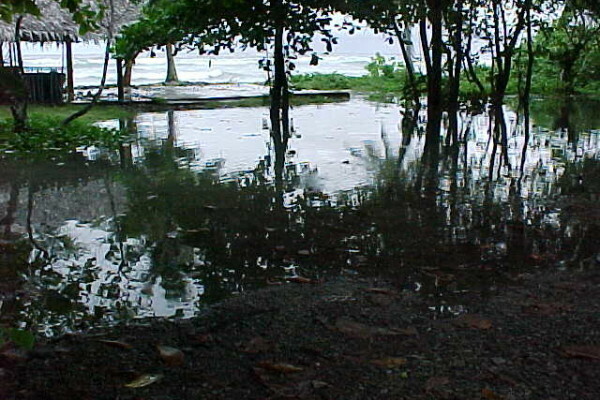 High tide flooding at Utwe (22 December 1999). 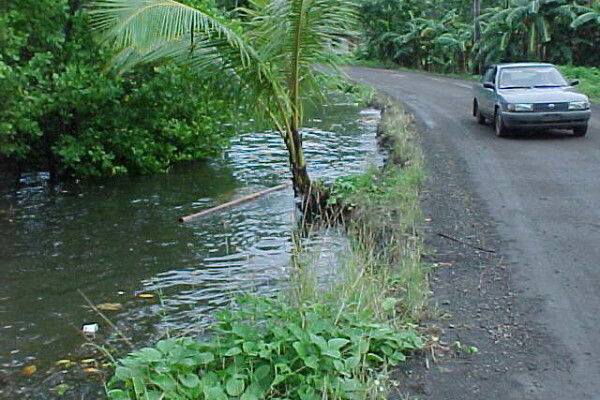 Kosrae experiencing some very high tides just before Christmas 1999, which caused some flooding, particularly along the Tafunsak and Malem coastlines. 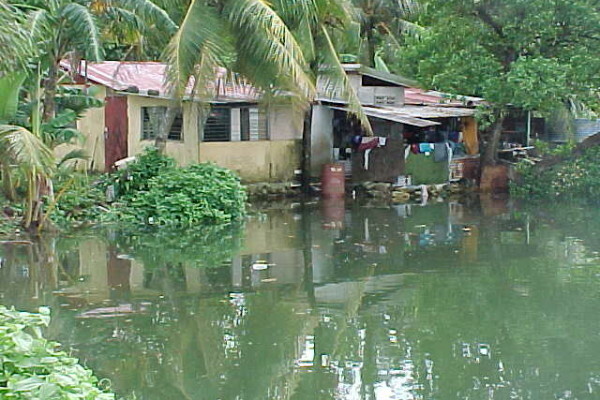 The high tides were due to a coincidence. 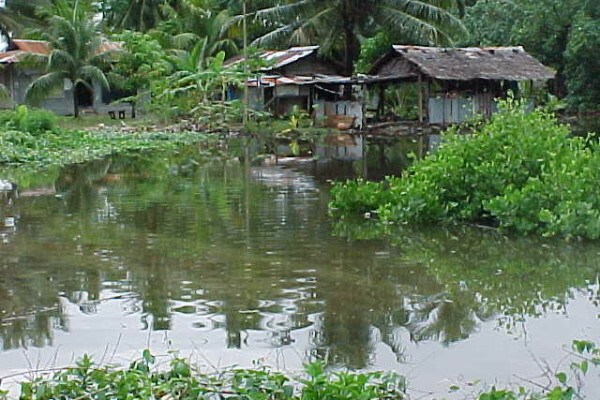 Firstly, the period before Christmas was the time of a normal Spring Tide (when the height of the high tides is greatest). 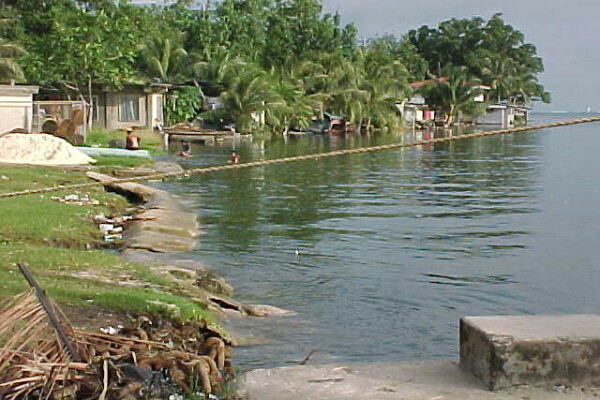 However, around this time these Spring Tides coincided with the moon’s orbit being at its nearest point to the earth (called perigree) and also the moon being at its closest point to the sun. 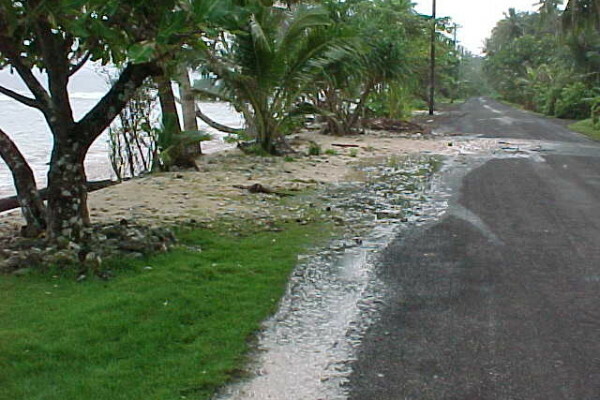 As tides are dominantly controlled by the moon and the sun, this effect magnified the height of the tide. 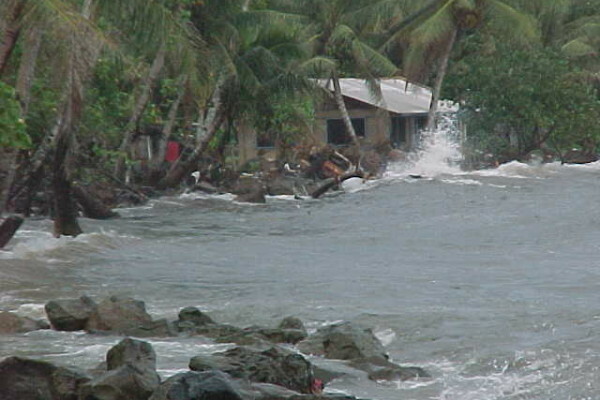 In addition the effect of the tradewinds from the North-East are stronger during this period. 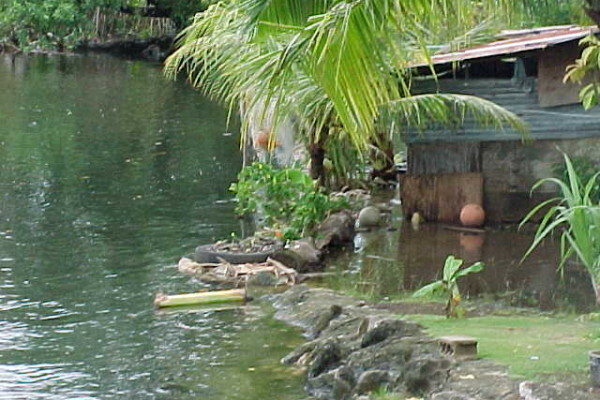 The effect of the tradewinds has two influences. 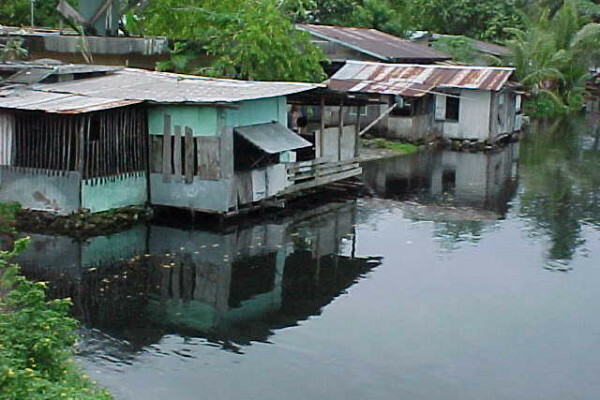 Firstly, the action of the wind on the water directly causes water levels to increase in the Western Pacific. 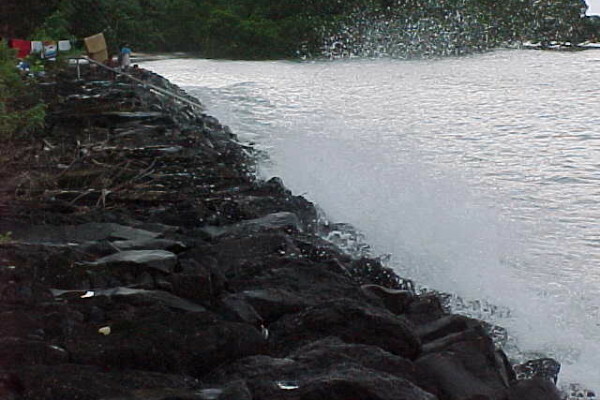 Secondly, the stronger wind causes larger waves. 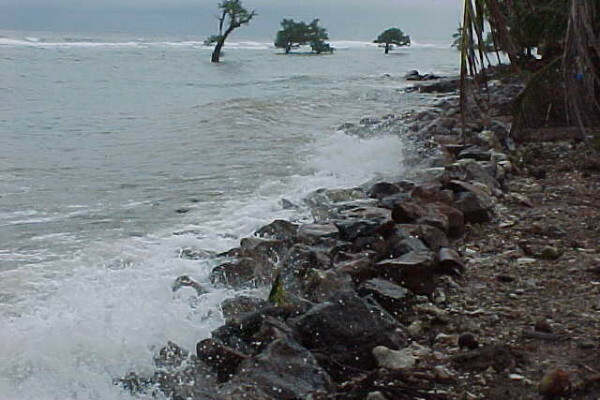 When these waves break on the reef, this causes the water level over the reef flat to increase, causing higher water levels at the coastline. 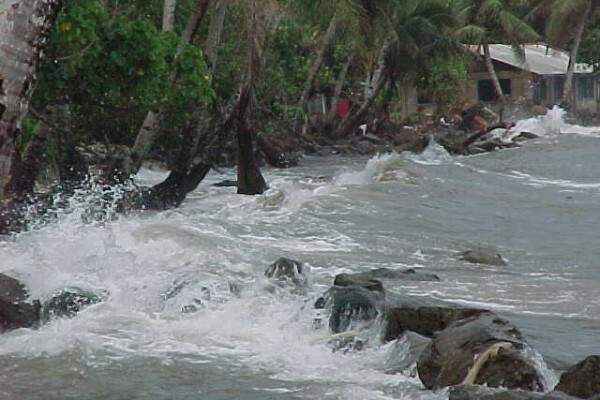 La Nina conditions were also occurring resulting in stronger tradewinds and hence higher sea levels pushing tides higher as well as larger than normal wave conditions off the north and east coasts.